No area of the body garners more attention in the fitness world than the abdominal muscles. Having a chiseled six-pack is the ultimate goal for many fitness enthusiasts. Although the term “core” has become more popular than “six-pack” in recent years, the goal of attaining a toned midsection has endured. Many people incorrectly presume that the core and abdominal muscles are the same. The truth is, the abs are just one of the many muscle groups that make up the core. The muscles that show up as a six-pack are the rectus abdominis muscles; a pair of vertical muscles that run from the sternum to the pelvis whose primary job is to flex the spine. Also included in the core musculature are the internal and external obliques, the transverse abdominus, the erector spinae, the multifidus, and the psoas. Despite these other muscle groups, the rectus abdominis invariably gets all the attention. While all these core muscle groups have their own specific and individual functions, they are collectively responsible for moving, supporting and stabilizing the spine. A vast majority of this moving, supporting and stabilizing occurs while you are in an upright position. However, a majority of the most common or popular ab exercises are performed lying on your back, which doesn’t make much sense. While supine, isolated exercises like crunches and sit-ups are not necessarily wrong or useless, they are not the most efficient or effective way to train the abs and core. A much better alternative is to perform compound exercises in an upright posture that require coordinated movement and stabilization of the spine by all or a majority of the core muscles. When it comes to this type of training for the abs and core, the kettlebell is the perfect tool. Kettlebells are ideal for compound movements like swings, squats, presses, and cleans. They also add an extra element of instability due to their unique shape and design, which requires more coordination, stabilization, and control, primarily through activating the core. This workout requires only one kettlebell. We recommend a 6-8 kg (13-18 lbs.) 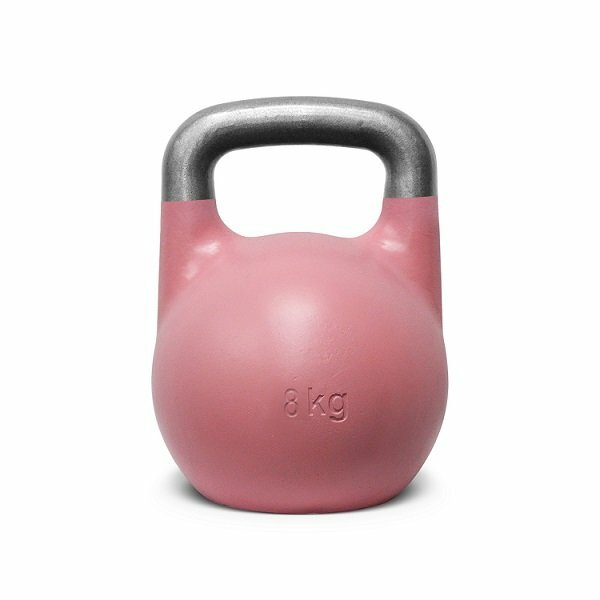 kettlebell for women and a 10-12 kg (22-26 lbs.) kettlebell for men. Perform each exercise for 30 seconds back-to-back in a circuit, then rest 30 seconds. Complete four circuits. For the swing, front squat, and around the world exercises, alternate sides each circuit. Stand upright, feet about hip-width apart, with a kettlebell on the floor about two feet in front of your feet. Hinge at the hips with a neutral spine and grab the handle with one hand. Pull the shoulder down and away from the ear to set your lats and upper back. The free arm will lightly tap the top of the kettlebell in the starting position, and will mimic the working arm throughout the lift. Swing the kettlebell back between your legs, making sure the bell stays above your knees and the shoulders stay at hip level or slightly above. Knees can be slightly bent. Powerfully extend your hips, contracting the glutes and core at the top of the lift. The kettlebell should float up to about shoulder height, with elbow slightly bent. Let gravity pull the kettlebell back down, only hinging at the hips when your arm hits your waistband. Clean the kettlebell into the rack position. The wrist should be straight and the elbow tucked into the body. Squat down, sending the hips back while maintaining a neutral spine. The elbows should come off the body to balance the weight of the kettlebell in the squat position. Lower hips down until thighs are parallel with the floor or slightly lower. Push into your heels to engage the posterior chain of the legs and return to the upright position. Stand upright holding the kettlebell in your right hand between your legs with your arm straight. Switch hands behind the back and continue to swing the kettlebell around to the side of your left hip. Switch hands again in front of your body to complete a full circle and repeat the circular motion. Stand upright with your feet slightly narrower than hip width apart, holding a kettlebell in each hand with your arms by your sides. Hinge at the hips and lower the kettlebells down to tap the floor. You should maintain a neutral spine with a very slight bend in the knee throughout the movement. If you cannot reach the floor maintaining neutral spine, bring the floor up by placing boxes underneath the kettlebells on either side of you. Push through the floor and contract the glutes to fully extend the hips and come back to the starting position. Lie on your back with your legs straight, holding the kettlebell in both hands at your chest with your elbows bent. Roll your upper body off the floor, coming into an upright position with the kettlebell at your chest and your legs straight. Slowly lower your upper body back down to the floor one vertebrae at a time, controlling your speed. Lay the kettlebell on its side on the floor. Place both hands on the ball of the kettlebell and come into the top of a push-up position with your feet wider than shoulder width for balance. Engage your core and upper body and hold this position for 30 seconds, maintaining a straight line from your head, shoulders, hips, and feet all while keeping your arms straight. Stand upright holding a kettlebell upside down by horns at chest level. Raise the kettlebell up and over one shoulder and around the back of your head. Rotate the kettlebell around your head, over the opposite shoulder and back down in front to upper chest level, keeping the elbows tight. Alternate the direction each rep. Stand upright holding a kettlebell at your side. 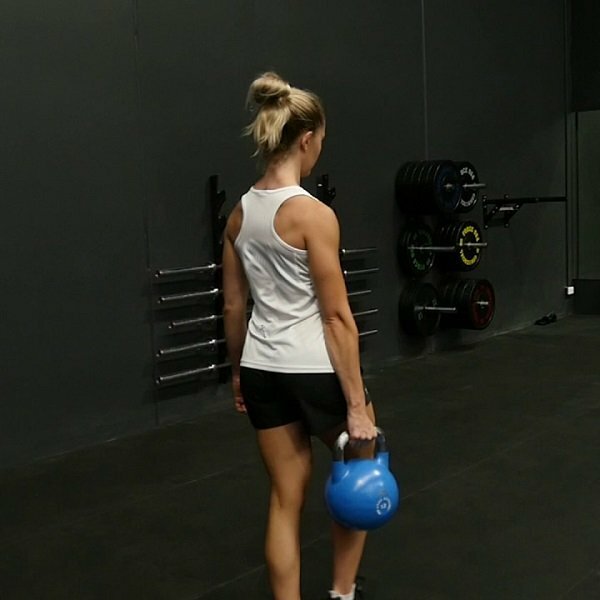 Walk at a normal pace for 50 meters (or as long as you can hold the kettlebell) while maintaining a neutral spine, slightly retracting the shoulder blades, and bracing your core. Resist letting the kettlebell pull your torso down on the side holding the kettlebell. Perform two lengths (reps) per side. 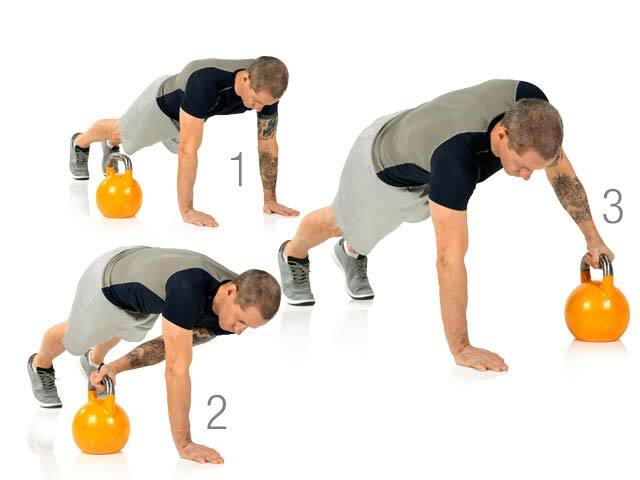 Start at the top of a push-up position with the kettlebell to the outside and slightly below your left hand. Reach your right hand underneath your body and grab the handle of the kettlebell. Drag the kettlebell across to the right side, laying it down with the handle facing towards your body. Place your right hand down to the inside of the kettlebell. Reach your left hand underneath your body and drag the kettlebell back to the outside of your left arm. Perform this kettlebell routine two to three times a week in addition to your regular workouts. Using kettlebells in your daily exercises will not only help you develop a strong but will build strength and stamina to help you reach your fitness goals. Amanda works with Kettlebell Kings as a senior writer. She had been put on this earth to inspire people and achieve their health and fitness goals with enthusiasm. Her niches are health, fitness, and kettlebell workout. Read more about Amanda’s writings at https://www.kettlebellkings.com/blog/.